Love these reusable bags. They were the perfect fit for my business. Thanks for providing such a great service. So many different color combos I was able to choose from. Great job CEP making me a very pleased buyer. Very creative and unique bags! The side pockets offered space for those tiny items that get lost in the bag. Very appropriate for business promotions. Will be ordering again! 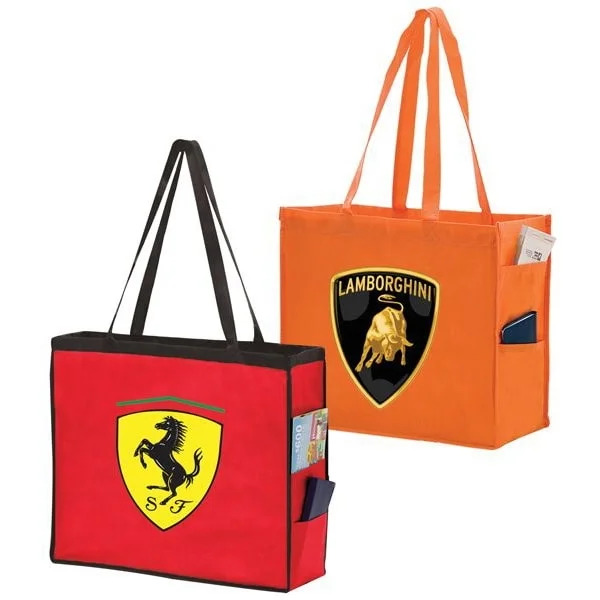 We loved the functionality of these bags as well as the many different colors which are available. The double pockets on the sides are a neat addition to an already great bag. Beautifully designed bags. I was able to put my makeup on the side pockets and it held wonderfully. Will be taking these bags on all my trips! These recycled bags are amazing! I added the extra bottom board and it was very reasonable. I use this bag every day and it's still in great shape! Perfect bag for sports players. We ordered these bags for our employee softball team, and our company logo looks awesome! Go team Custom Earth Promos! 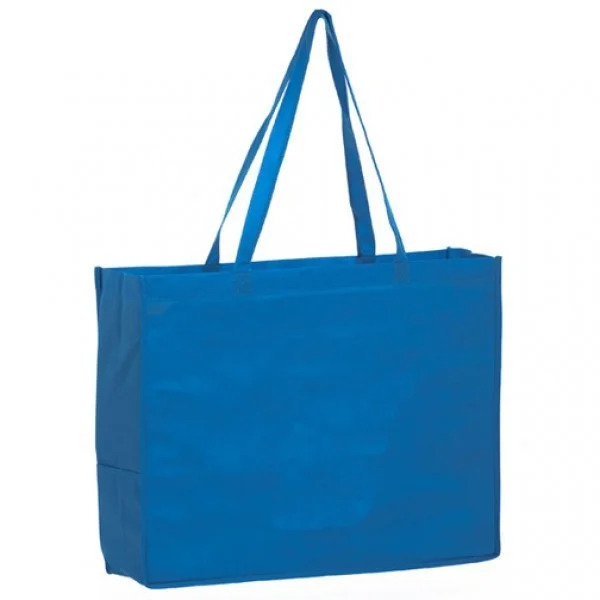 These totes offer and extra large design space perfect for promotional purposes! Really pleased with the outcome! I'm a coach at a high school and I ordered these bags for our students to carry their equipment in. It was really important to our staff that the bag we chose would be extremely beneficial to our student body. We're more than pleased with our order. The bag is incredibly durable and spacious which was a perfect fit for what our students needed. Looking into customizing sports water bottles next and we're stoked! 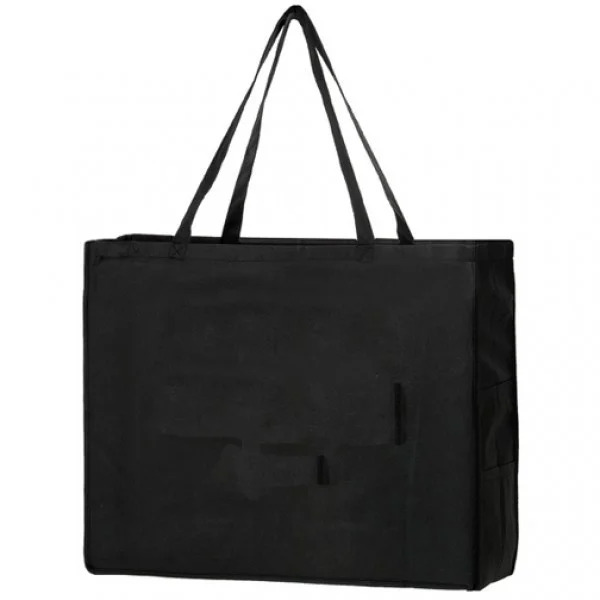 Without the quick production of these totes, we would have missed a huge promotional opportunity. Thanks CEP for your amazing customer service! Extremely pleased with the look & feel of these bags! Love the long handles! The extra large design space available on these toes is ideal for promotional purposes! Really pleased with the outcome! I love the double pockets on these totes! Super practical for retail! I love these totes! They are budget friendly without compromising style or quality! 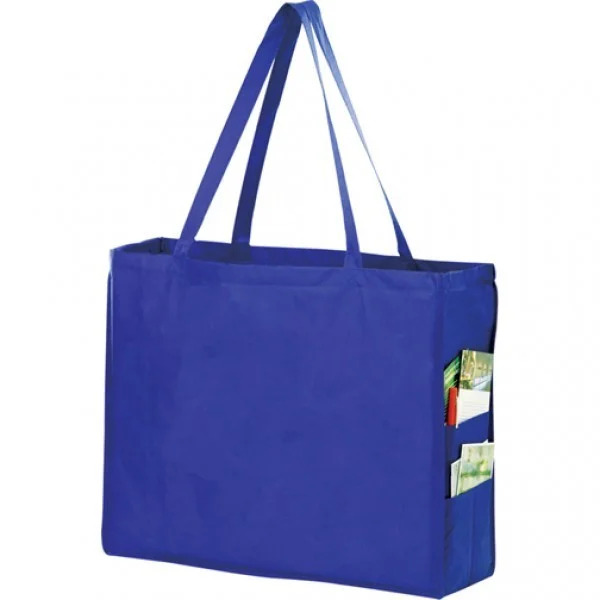 Our large shopping totes have been a huge tool in our company gaining exposure. They have truly been a hit at all the venues we attend. I really like how these totes are tear resistant, they are the perfect fit for my business! Love working with Custom Earth Promos on all our projects. Great prices and quality products all day. 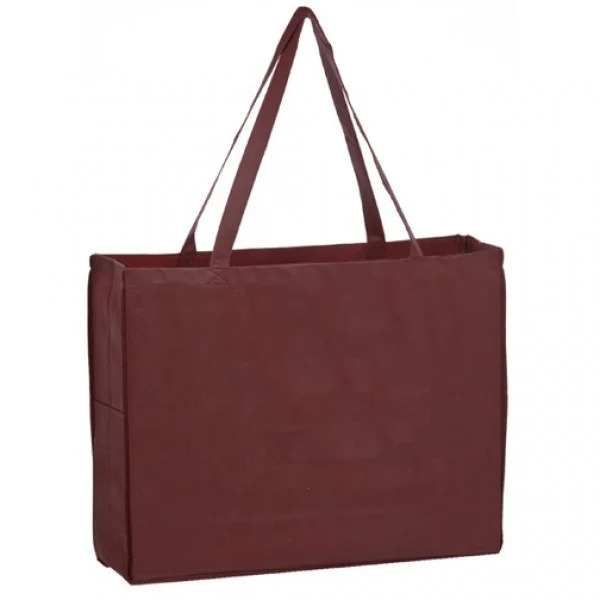 We loved all the customization options available with the eco-friendly shopping totes. 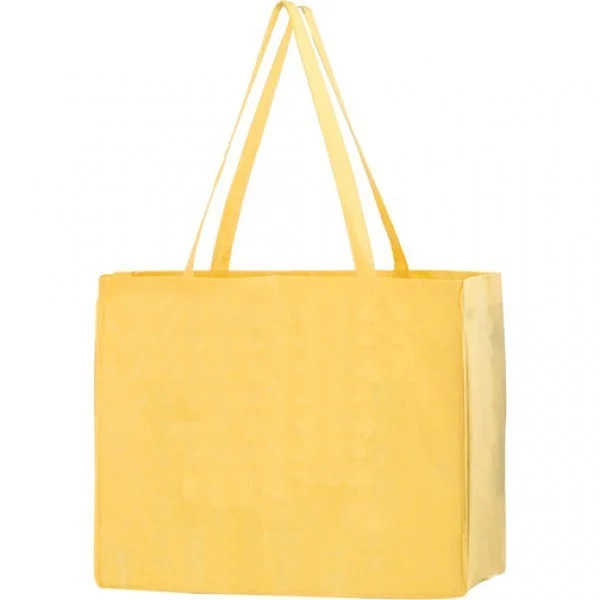 We love that these large eco-friendly shopping totes are reusable, and made out of recycled material. 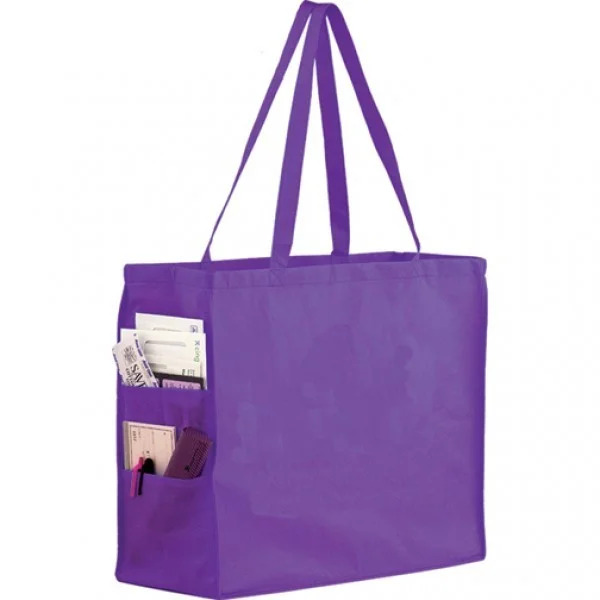 These totes offer an enormous capacity making them perfect for my business. Couldn't have asked for a better product! Placed an order for 1500 reusable shopping bags and couldn't be more impressed with the finished product. Great doing business with you guys. Customized these large shopping bags for our kiosk at the flea market. Great way to advertise our business and gain expose within the community. A great bag for the price. We were very impressed with the finished product. Sacrificing quality for price was a main concern, but it was a unwarranted worry. 13 Bold Colors In Stock – Any Bag Color Overseas! 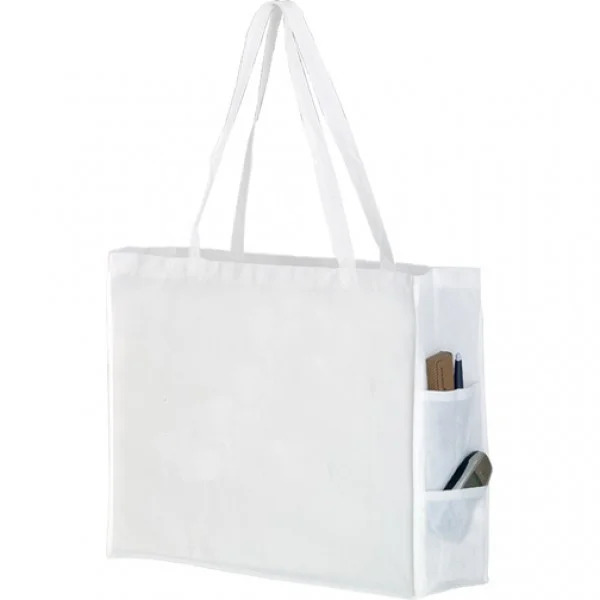 These large, reusable shopping totes are a great size for retail shopping, and each tote replaces disposable plastic bags that are disastrous for the planet. 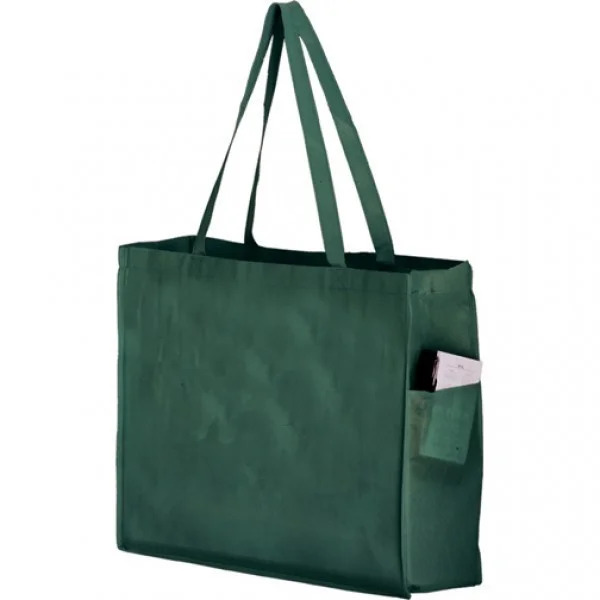 Our wholesale shopping bags are extremely cost-effective, and a wonderful opportunity to help the environment. Customize your own totes today; we can help with artwork revisions, creating virtual images, samples, and much more! Promote your business for under $1 without skimping in style or quality! 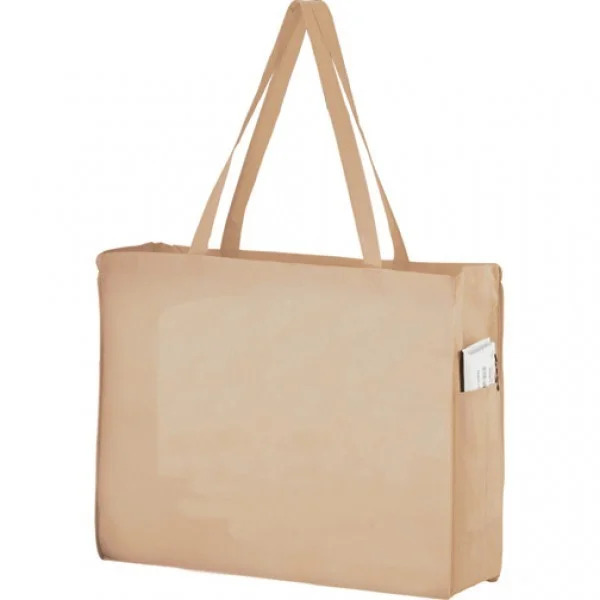 These spacious, 20-inch wide wholesale shopping bags are popular with boutiques, consignment stores, and other retailers because of their huge size, advertising space, and exceptional value. The enormous capacity of these custom recyclable bags will replace disposable plastic bags with every use. 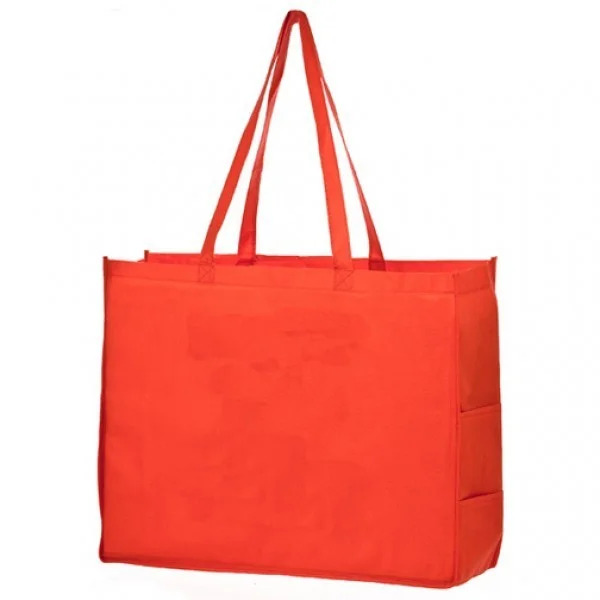 This large tote is made from non-woven polypropylene (80 GSM), an eco-friendly material made out of 100% recycled products. 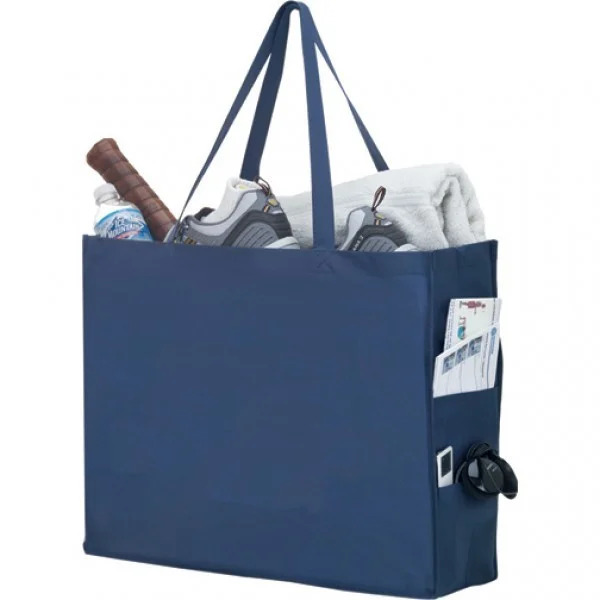 This bag features a large capacity interior, handy pockets on the sides, and many fabric color and imprint color options. The extra-large design allows these totes to accommodate oversized contents, making their functionality universal. And it's always a breeze to re-order reusable bags with Custom Earth Promos; we keep your information on file, which will save you time and money on set-up fees! Its time to stock up! 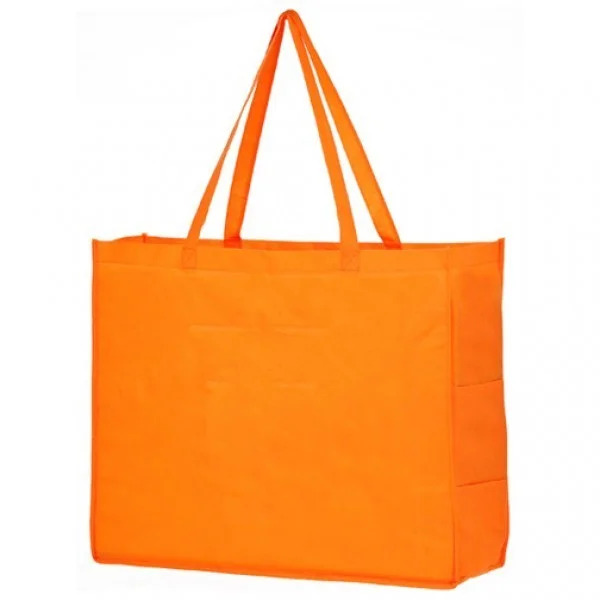 Ordering your company's eco-friendly shopping bags in bulk with our direct overseas factory makes business sense. You will save more than just money by choosing Custom Earth Promos overseas; we take the stress out of doing business internationally. In addition, we include graphic design services for free! Custom options can include an unrestricted, edge-to-edge printing area, multiple silkscreen colors, or a heat transfer for a fraction of the cost to print domestically. One of the best options you get by ordering overseas is our ability to provide you with a trim and handle in a custom color. This is a great way to make your logo pop. The tote's dimensions can be customized to fit exactly what you need. The material can also be upgraded to a thicker GSM or include lamination. 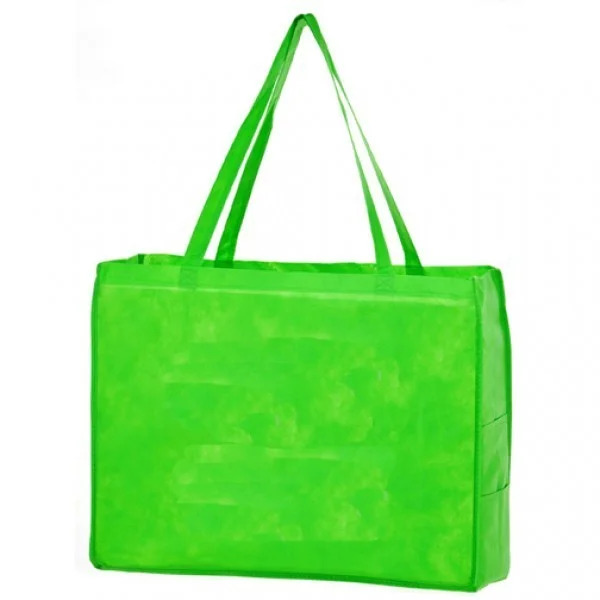 You will be sending your customers the message of your company's environmental awareness by offering earth-friendly, inexpensive, convenient, and durable reusable bags from Custom Earth Promos, perfectly suited for day-to-day shopping needs.